The Heritage Centre began after there were calls for a Museum facility to be created in the town. The founding members of the Gainsborough Heritage Society set about trying to prove the need for such a place in the town. At the time they got together and created an exhibition at Richmond Park displaying the history of the Town, little did they know on day one that they would end up with so many visitors queuing to support them, so they would have to allow the exhibition to run longer than planned. A year or so later and the Heritage Centre had its own premises in the building formerly known as Marshall's works and the Centre had many successful exhibitions with a vast array of exhibits permanently on display for all to see. Jump forward a few years more and the volunteers of the Centre are dealt a heavy blow, the developers of Marshall's Yard a new shopping Centre have told the volunteers they have to find somewhere else for the Heritage Centre and the long arduous task of finding storage for items began. For what seems like a long time, the Heritage Centre volunteers kept themselves busy behind the scenes in the attempt to locate premises that would be suitable to get them back on their feet again. After a lot of searching for locations and much hopefulness the volunteers landed lucky with a building that was due to become available in town. The terms were agreed for use of the Old Post Office as the new home of the Heritage Centre. In the beginning each room was in need of major repair and renovation, walls were removed and others built till the Association ended up with a building that was barely recognisable as the one that was originally offered. Research room, shop area, toilets and kitchen were created. Volunteers cleared rubbish, cleaned and painted off scaffolding to ensure the Centre opened. At the time the Centre had very little to offer but it was the catalyst that led to the next big development. By chance and through considerable amount of paperwork, the Heritage Centre was awarded a grant of £25,000 from the CO-OP as part of their birthday awards, to enable the exhibition room to be made useable. £25,000 sounds a lot but it really does not stretch very far when the project includes plastering, electrical and plumbing works to be completed. For the Association this was a massive step forwards and allowed the Centre for the first time to be able to have a dedicated changing exhibition area. In 2015, the Gainsborough Heritage Association celebrated its 21st anniversary and the photo story below was created to commemorate the anniversary alongside commemorative pin badges. 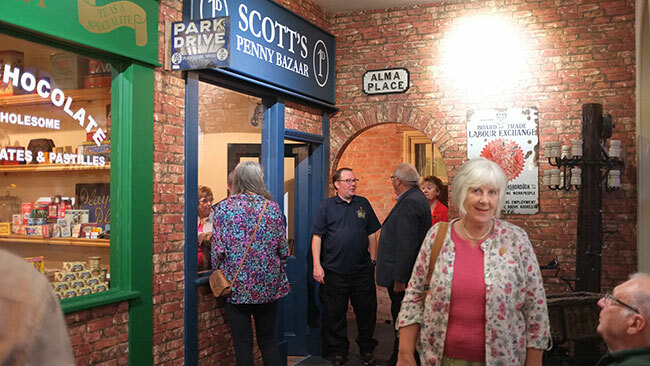 The Centre now has a working research library, shop, tea room facilities, and permanent exhibitions including industrial exhibits, a street scene, post office, shops, house and yard as well as temporary exhibition space. In October 2019, the Gainsborough Heritage Association will be celebrating their 25th anniversary.